After I had been writing about cars for a couple of years, I began noticing a funny phenomenon: At US car events, people would recognize me as that Canadian guy while at similar events here in Canada, people had never read my work. Funny thing that. It just shows one of the many differences between more traditional outlets and those of us who work strictly on the web. A few of our friends here in The Garage have recently undertaken new endeavors on the web that I thought our readers might enjoy visiting. Ask any older Jag owner and theyÃ¢â‚¬â„¢ll tell you, Ã¢â‚¬Å“If a JagÃ¢â‚¬â„¢s not dripping oil on your driveway, then youÃ¢â‚¬â„¢d better check that it has some in itÃ¢â‚¬Â. Regular readers may recognize Crash Corrigan from his regular comments here in The Garage. Crash doesn’t really come to us through traditional media, rather through one of the Auto123. As one of the heavy hitters in the Canadian online auto media, they may as well be a newspaper outlet. Combining his British wit and more than a few decades wrenching British tin, CC knows his stuff and isn’t afraid to let you know in his newest project Car Keys. With the aid of Simon Burn, Car Keys brings unique reviews and they guys are promising some video along the way too. Real life has been a real whirlwind here in The Garage this week, so now it’s time to catch up a bit. The Auto Blogosphere has been pretty busy this week, so let’s start Speed Shifting! Classic rallies are all the rage these days and Phil over at Classical Drive tells the story of the The Jewel That Is Jordan. Essentially, this is a rich guys’ trip to a super rich country. It’s always a sad time when a racetrack closes it’s doors for the last time. Full Throttle has an Obituary for 2 more that have bitten the dust. Kevin Kelly, from WIRED has launched a new blog called Street Use, showcasing some of the best hoonmobiles across the planet. Maybe the coolest (or most frightening) are the Iraqi gun pick ups. American pick ups that have been modded with bullet plate glass, run flat tires and turrets. Mel Gibson must be jealous. As a car crazy kid in the Seventies, I loved to read car stuff. I had (still have) the full collection of Black Tiger racing books from the Sixties. But the most fun memories are of riding in the backwards seat of the old Dodge Monaco wagon, reading about Krass & Bernie in the CARtoons comics. From the groovy bell bottoms to the wicked slicks and sidepipes, these guys rocked my world. Then, as time marched on, Mom threw them all out one day and I’ve never seen or heard of them since. Until yesterday, when I found Paul Makowski and his site dedicated to CARtoons and the other comics that the Petersen group put out. Well done Paul, your site brings back many memories. As regular readers of The Garage may have noticed, I’ve developed a bit of a thing for the Lotus Elise. The traditional Lotus concept of light weight and modest power has always appealed to me. Combine that with a reliable, modern powerplant and you get an unbeatable package. Today, I came across a super blog by a guy named Chris from Kentucky. My Lotus Elise follows Chris’ travels with his new Elise. The blog showcases Chris’ skill with a camera, showing his Elise in som fab locations including the infamous “Deal’s Gap” in North Carolina, reputed to be one of the best driving roads in North America. I’m looking forward to seeing where Chris shoots the Elise in the future. I just came across a brand new blogger blog called Cars & Photos. It’s a pretty simple concept, a place for photogs to post some great car pics. There are some really nice shots. 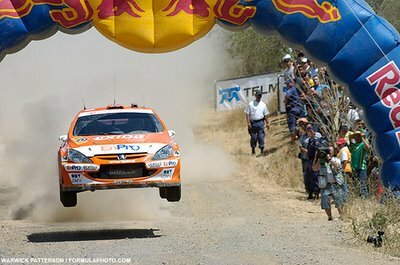 The above pic is of Henning Solberg at the 2006 WRC Mexico, taken by Warwick Patterson of Formula Photo. Blair Valley Media is happy to announce the launch of our new toy blog, The Jumping Bunny. This is our first blog that is outside the realm of blogger, so it has been an exciting learning experience. The Jumping Bunny is a essentially a toy review blog, but at times we may talk about all sorts of kid stuff. We hope you will come and visit soon. I’ve just come across gear6 which is a nice clean looking blog set up by Casey. I like his shifter logo & title font. gear6 has a few neat items that i haven’t noticed on other blogs.